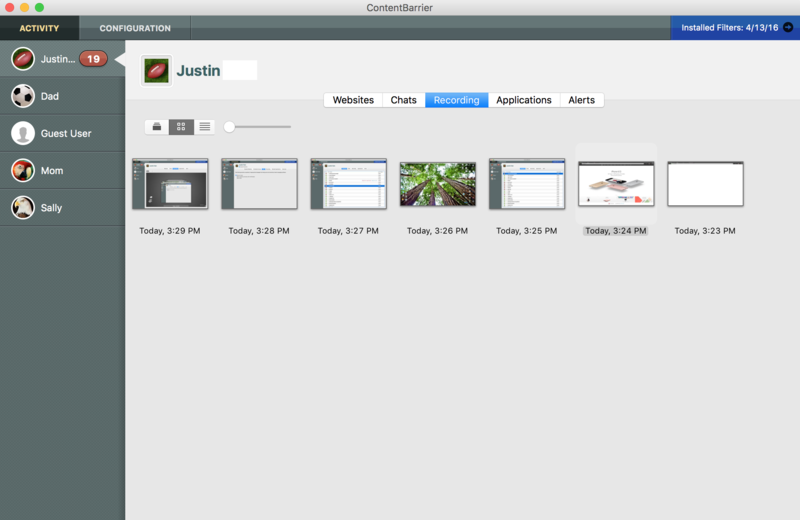 ContentBarrier is a parental control program for Mac OS X. It is designed to filter and block certain Internet content according to the settings you choose. ContentBarrier blocks adult websites, sites with subjects not fit for children, and blocks chats when predatory language is used. It also blocks certain protocols, or types of Internet communication, that you may not want your children to use, such as peer-to-peer and other file sharing protocols, online games, streaming audio and video, FTP, SSH and more. 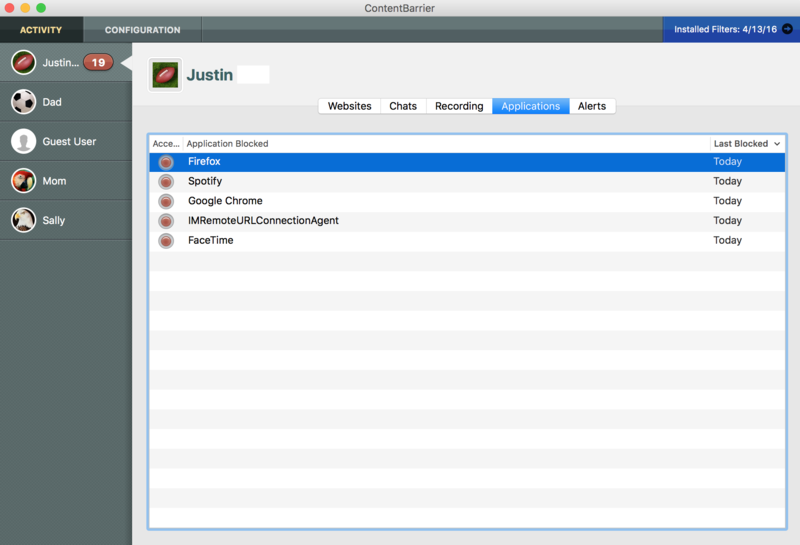 ContentBarrier works with multiple users, and interfaces seamlessly with the Mac OS X user accounts on your computer. If you have several children, you can set different limitations corresponding to their age or maturity. You can choose whether they have access to newsgroups, e-mail, or whether they can download files. You can set the program to let them only use the Internet at certain times, and on certain days. You can choose to block or allow specific websites, allow users only to use selected applications, and block access to specific types of content, such as streaming media or peer-to-peer file transfers. The program can even send you e-mail, automatically, when certain events occur. 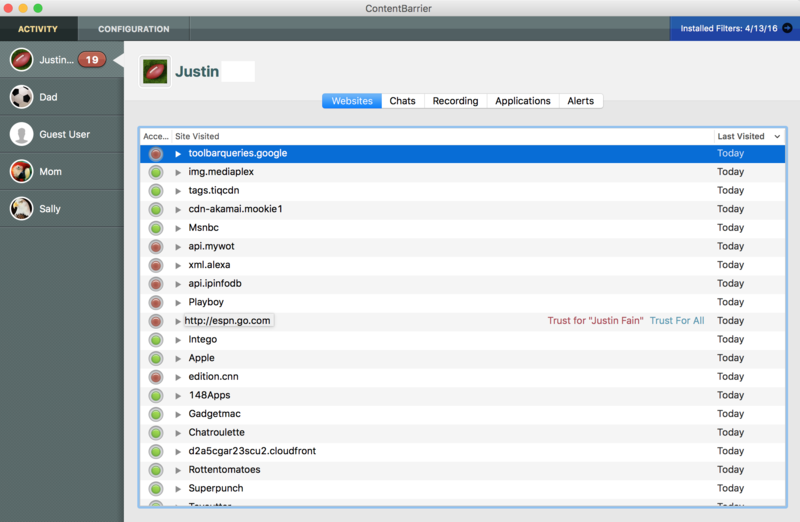 And you can view logs and manage some of ContentBarrier's settings over the Internet, using any web browser. ContentBarrier sets up a protective wall around your computer. Its pre-defined filters let you choose what you don't want your children to see, and you can create your own custom filters as well. Inappropriate websites are blocked, shielding your children from content they are too young for. Additional filters block content by program type, such as chats, newsgroups and more. ContentBarrier keeps a complete log of all websites visited, whether blocked or not, and records which applications have been blocked, if you choose to block certain programs. You can also record screenshots and keyboard activity, giving you a full record of your children's activities on the Internet. ContentBarrier makes the Internet a safer place for your children. ContentBarrier is installed in your Mac's Applications > Intego folder. To open ContentBarrier, go to this folder, then double-click the ContentBarrier application icon. Monitored users have their activity (primarily websites visited) recorded. Using ContentBarrier, you may go back and review this information at any time. Predator reports provide information about the anti-predator feature in ContentBarrier. This feature looks for suspicious phrases in standard chat protocols. The report will contain information about any chat sessions blocked for violating an anti-predator rule. Complete reports contain information about activity that ContentBarrier monitors as it is configured for each user. This will include information about websites visited, etc. If you’d like to receive these reports, simply choose the option and enter your email address. 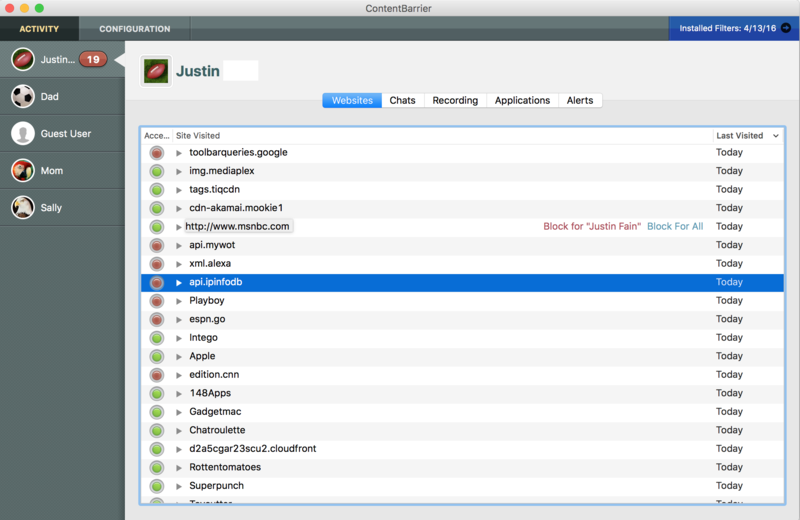 By default ContentBarrier uses the Mac OS X Administrator password to access the application and make changes. The password preferences are located in the ContentBarrier Preferences. You can access the ContentBarrier Preferences by clicking ContentBarrier > Preferences…, then click the Password icon. You can set a password that is unique to accessing ContentBarrier by selecting "Use ContentBarrier Password". You will be presented with a new window that asks for your new password. You will also be asked to verify the new password and for a hint if you forget the password. You also have the option to change your ContentBarrier password if you already have a unique password assigned. When you set up ContentBarrier, you are it's administrator, with access to all the controls that limit or grant permission to access the Internet. The people you are overseeing - whether children or employees - are called users. This section shows you how to create and delete users, and control how you and other administrators see users. When you've finished running the Setup Assistant, and every time you launch ContentBarrier thereafter, you'll see its main window. At the left is a list of your users. If you click a user, the right-hand pane shows you which settings are applied to that user. A check box next to the user's icon gives you quick access to a frequently used function: the Enable protection checkbox lets you turn ContentBarrier's filtering on and off. Mac OS X 10.6.8 (Snow Leopard) and later offer a "Guest" account that you can configure in Mac OS X's Accounts preference pane. If you activate the Guest account, any user can log in temporarily; they have standard access to your Mac, but when they log out, their user folder is deleted. This is great for when you have visitors who want to use your Mac temporarily. After you create a profile for one of your users, you may want to apply the same profile to others. To do this, apply all the settings and filters you want to a user. Make sure you have selected that user in the ContentBarrier Users list, then select Export Profile… under the File menu. Give the profile a name and save it wherever you want. If you wish to apply this profile to another user, click that user's name, then select Import Profile… from the File menu. Locate the saved profile in the Open dialog that displays, then click OK. All the settings contained in this profile will be applied to the selected user. You can make changes to this user's settings, modifying the settings you imported from the saved profile, but these changes will not affect the saved profile. In this way, you can set up a standard profile for many users, then apply it to others. You can also set up a number of profiles based on the ages and maturity of your users, and using the import/export function, apply them to new users as needed. You've seen how to use the ContentBarrier Setup Assistant to create and configure your users, in the section Using the Setup Assistant. You can also make changes to these configurations from ContentBarrier's main window, which provides access to more detailed configuration options, as well as an overview of your users' settings and a summary of their past activities. User information: at the top of the screen, you see the user's name, whether that user's Internet access is being filtered, and whether you're receiving reports on that person's Internet usage. You also see a silhouette for the user, or a photo, if you have set one. Filter settings: the middle section shows the current settings for each of ContentBarrier's filters. A colored dot next to each one gives you information about the type of filtering: green means there are no restrictions or monitoring, orange means there are some restrictions, and red means access is being blocked or tracked. Texts next to each filter icon give you more information about the filter and its settings. For more on logs, see Using Logs later in this manual. ContentBarrier separates its filtering functions into six categories: Blocked Websites, Scheduled Access, Chat, Recording, Blocked Applications, and Advanced. Each of these six tools is represented by a button underneath the user's information in ContentBarrier's main window. Next, we'll discuss each of these tools in detail. ContentBarrier gives you three options to prevent the selected users from accessing certain websites. They are: Allow access to all websites, Block selected categories of websites, and Only allow selected websites. Each has its own screen of configuration options that resembles the screens you saw during the setup process, except with more options. The Allow access to all websites option is the simplest, as there are no settings: if you select this radio button, the selected user can view any web site. The Block selected categories of websites choice is ContentBarrier's default. It provides the most options, which are divided into four sections: Filtered Categories, Trusted Websites, Blocked Websites, and Custom Keywords. Next, you can choose to allow your user to access certain websites, regardless of whether they fall into a forbidden category, by clicking on the Trusted Websites tab. To add a web site to this list, click Add trusted website, which puts "www.example.com" into the list. This is just a placeholder: to change it to the site of your choice, double-click that line and type the site for which you want to allow access. Note that all subdomains will be allowed, so allowing google.com also allows www.google.com, maps.google.com, and news.google.com. However, the opposite isn't true: If you allow only www.google.com, the user will be unable to reach google.com (without the www). To remove a site from the list, click it and either press the Delete key or click the minus sign at the bottom left of the list. Users can never reach a site that you've listed on their Blocked Websites, even if it doesn't fall into any forbidden categories. If you've created any entries in a user's Custom Keywords list, that user can't reach any site on which that word appears. In the event of a conflict - if you've listed the same web site listed in both the Trusted Websites and Blocked Websites lists, for example - ContentBarrier will block the site. Enable SafeSearch, which prevents the user from seeing questionable sites in the search results of several popular search engines, such as Google and Yahoo, which offer a SafeSearch feature. Block encrypted websites prevents the user from reaching any site that uses the HTTPS protocol, as is common in sites where money or confidential information changes hands. Checking this box will effectively stop nearly all online shopping, although it will also block other sites. Regardless of how you decide to block (and allow) access to sites, the popup menu at the bottom of this window gives you a choice of what happens when your user attempts to reach a blocked site. By default users will be sent to a web page that tells them why ContentBarrier has blocked their access. To give this user access to the page - if it was incorrectly blocked, for example - click the ALLOW THIS WEBSITE… button at the bottom of the page. A dialog box comes up with options to give access to the entire domain (example.com in this case), just the specific web page the user attempted to access, or any external resources associated with the page. If you click Preview, a window appears that displays the requested page so you can check to see if it's safe; you'll see the choices given above. Unlock provides access to the page, site, or pages containing the specified text, depending on which of these you have checked. If you feel a web site was blocked unjustly, you can click Submit this link, which will send a report to Intego. Intego will examine the page and see if we feel it should not be blocked. 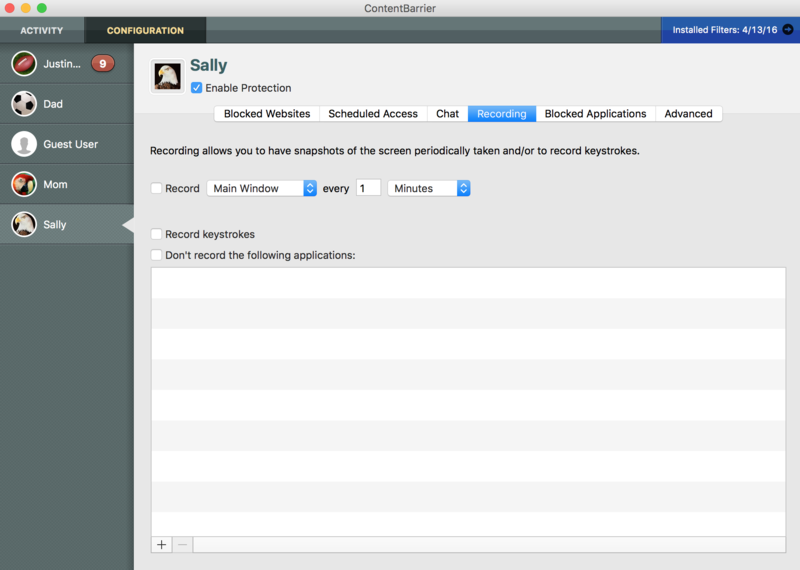 ContentBarrier lets you filter or block chat sessions, and offers a powerful function to protect your children when using chat programs such as iChat, ICQ or AIM instant messaging software. The AntiPredator function filters chat texts for predatory language - that is, language asking for personal information about the user. This includes such questions as "are you home alone?" and "what is your phone number?". To enable chat filtering, select the user you wish to control in the left column, then click the Chat button. 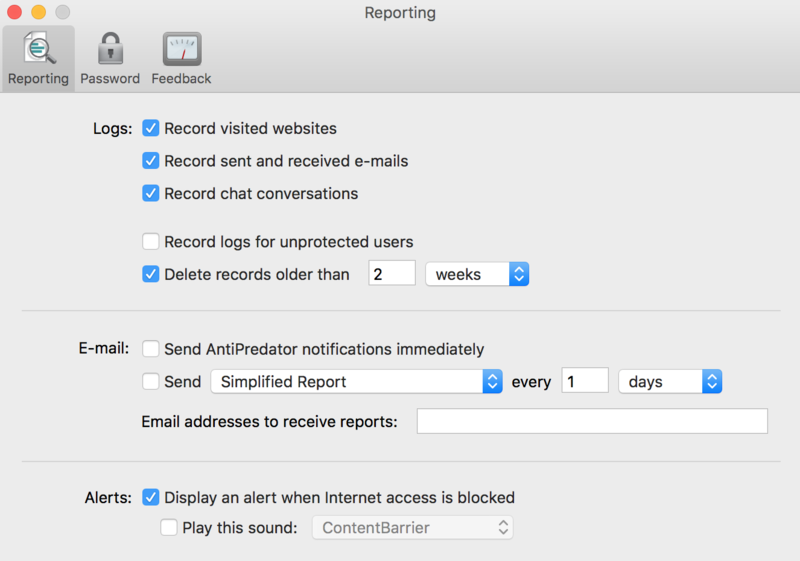 As with web filtering, you have three options: Allow all chats and Block chats (which needs no explanation), and Block suspicious phrases with AntiPredator, which we'll examine. Right-click on the phrase if your mouse allows this action. By default, all the AntiPredator phrases are active when you turn on chat filtering. You can disable any of them if you wish by unchecking them; or by selecting them and choosing the Allow selected phrases command found in the contextual menu which is displayed by clicking them and holding your keyboard's Control key, or by right-clicking them. While ContentBarrier contains an extensive list of text strings to be filtered, you can also add your own words and phrases. You could add, for example, your address or phone number, as well as any other personal information you feel should be protected. To add a filter for either Incoming or Outgoing data, click the + button. A new line displays at the top of the filter list. Enter the word, phrase or sentence you wish to filter, and enable it if desired by checking the box to its left. Click the menu in the Kind column and select whether you want this text to be filtered for incoming chats, outgoing chats or both. It is best to filter the shortest possible texts.ContentBarrier looks for the exact text you have entered in the filter, and, if the user types it differently, it will not be blocked. For example, rather than enter "my phone number is 555-1999", it is best to enter just "555-1999". ContentBarrier lets you set a schedule for each of your users that allows them to access the Internet only on certain days and for a certain length of time. 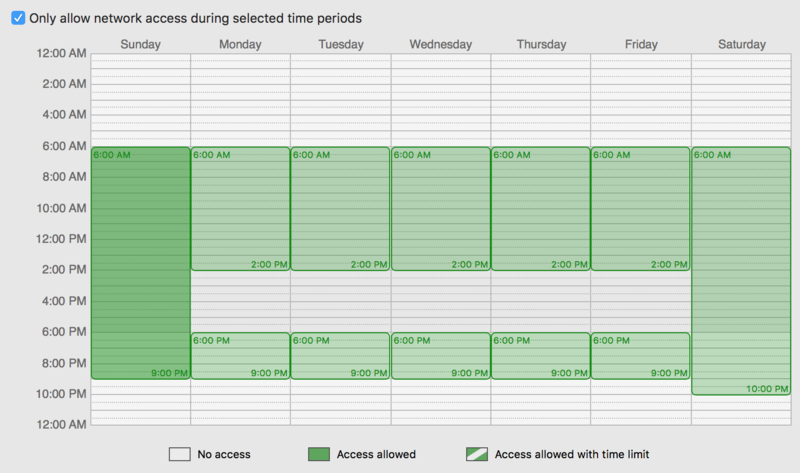 To access schedule settings, click the Scheduled Access button in the ContentBarrier button bar. By default, all users are granted Internet access at all times. 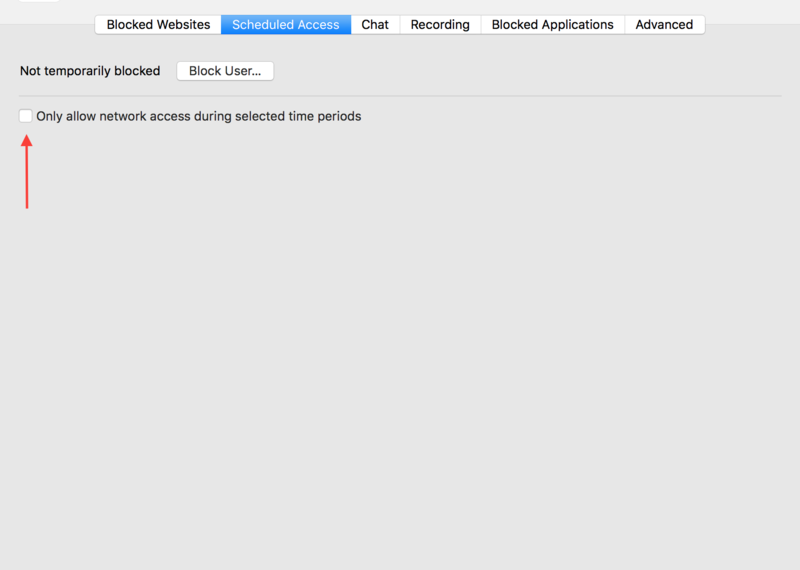 To restrict access to times you'll specify, click Only allow network access during selected time periods. When you first see the timetable, all the cells are blank, representing that the selected user is not allowed to access the Internet at any time. To grant Internet access at given times, click the time cells in the timetable - each cell represents one hour. You can click individual cells, or you can click and drag to cover longer periods. As you click cells, tooltips display showing the periods that you are enabling or disabling. You can allow or block access for any hour-long period on any day of the week in this manner. You can also click and drag in any direction to change cells. If, for example, you want to block access when a child comes home from school until suppertime, you would first enable all times, and then drag from 2pm on Monday to 6pm on Friday to disable those times. However, attempts to connect to the Internet with other applications might not cause an alert to be displayed; in some cases, access will simply be blocked. Some applications will display their own alerts, saying that they could not connect to the Internet. You can also allow Internet access for a limited period of time in between specific hours-for example, half an hour between 6pm and 9pm. To do so, first enable that time period by clicking and dragging to create a green access block; then, double-click the cell to Edit. A panel will appear, allowing you to set the amount of combined Internet access permitted during that period. Drag the slider to the time limit you want to allow. 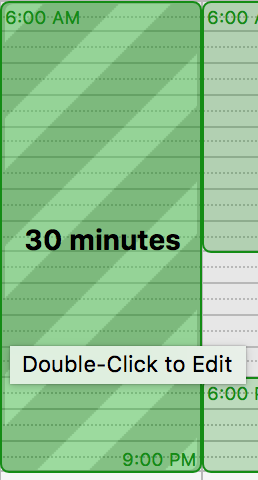 After you click outside of the panel, your choice will appear as a striped green area on the time chart, specifying the amount of time allowed. To change the amount of time available in a time limit, move the cursor over one of the sections with a time limit and double-click to edit. To start or stop a session, just drag the slider to Started or Stopped. Below the slider is the remaining time. To remove the controller from the screen, you can click the - button; the controller is then minimized into the Dock. Clicking the controller's icon returns it to the screen so the user can start or stop their Internet access period. To turn off all schedules and therefore allow Internet access at all times - with all of ContentBarrier's other filters in place, of course - uncheck the Only allow network access during the following periods box. If you uncheck this box, the schedule will disappear from the window. When you check for box again, you will see the schedule again unaltered. ContentBarrier gives you the option of allowing users to only access the Internet with specific applications. Rather than filter web access by category, for example, you can prevent a user from using any web browser. You can choose which applications can access the Internet; all other applications are blocked. To set up application filtering, click the Blocked Applications button on the ContentBarrier button bar, then check Only allow selected applications to connect to the Internet. Application filtering will supersede all other ContentBarrier filtering rules. If, for example, you do not add a web browser to the application list, then web filtering will have no effect: all websites will be inaccessible, as no program that accesses them is available. However, ContentBarrier's other filtering rules apply to all applications added to this list. So if you choose to allow a user to access the Internet with a web browser, then ContentBarrier's active web filtering categories will filter websites visited. To add applications to the list, click the + button and navigate to your Applications folder. You can also drag applications from a Finder window into this list. As you add applications, they display in the list. To remove an application from the list, click it to select it, then either click the - button or press the Delete key. If, at any time, you want to stop using application filtering for a given user, simply click their name in the Users list, click the Blocked Applications button, then uncheck Only allow the following applications to connect to the Internet. When ContentBarrier blocks an attempt to access the Internet by a non-approved application, it displays a warning. Note: some applications may use "helper" applications when they connect to the Internet. One example is Apple's Safari, which requires that WebProcess access the Internet. If you add Safari to the list of allowed applications, this will not add WebProcess. To add the latter helper application, go to your user's log, click Applications, then find which applications have been blocked. (There may be others.) Click the disclosure triangle next to an application or helper application you want to allow, then hold down the Control key and click on its name or right-clicking. A contextual menu displays with one option: Allow Application. Choose this and the application in question will be added to the list of allowed applications. You may also want to check the logs from time to time; many applications that you might not expect need to connect to the Internet. Apple's Address Book, for example, makes an Internet connection, as does Help Viewer, the application that provides Mac OS X help. Your users will probably tell you which applications are blocked, but you can always see them, then allow them, from the log. 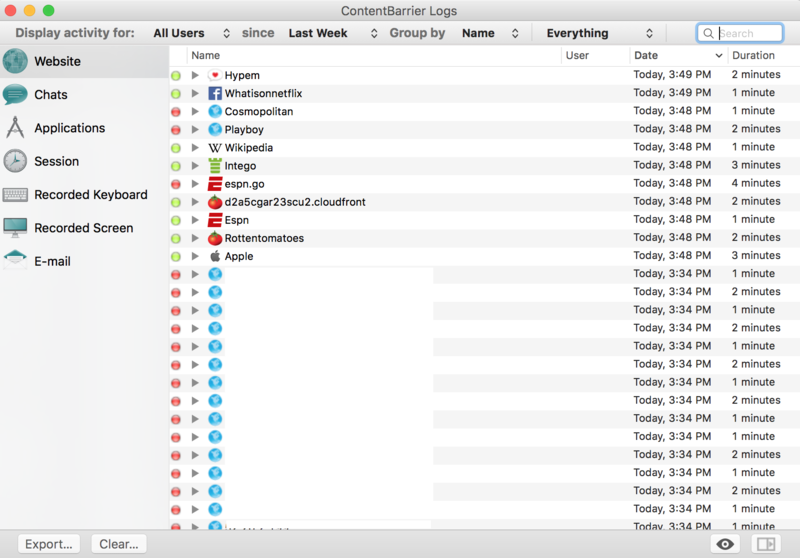 ContentBarrier lets you keep track of what your users have been doing by secretly taking pictures of what's on their screens and recording what they type into a hidden log. To access the Recording controls, click the Recording button in ContentBarrier's button bar. While chatting and web browsing are two of the most popular Internet activities, ContentBarrier also provides filtering for other types of Internet access. To adjust settings for these, click the Advanced button. ContentBarrier allows you to apply its built-in content filters to e-mail messages that are transferred through any e-mail program. Allow e-mail: all e-mail will be allowed through. Try to filter inappropriate e-mails: ContentBarrier will scrutinize the contents of incoming and outgoing e-mail and block those that it believes are dangerous. ContentBarrier uses the entire list of AntiPredator phrases for this filtering; even if you have only activated certain phrases in the Chat Filtering preferences, those choices do not affect e-mail filtering. Block e-mail: forbids all e-mail from coming through standard e-mail programs. Note, however, that this setting will not affect e-mail delivered in other ways, for example on message boards or websites. ContentBarrier can filter Usenet newsgroups, which offer discussion forums using a specific protocol and software. To activate newsgroup filtering for a selected user, check the Block newsgroups box. This setting will only block newsgroups that are accessed through such software, and will not affect those that are displayed on a web page. However, you can block those websites by checking the Newsgroups category in the Web filtering screen. ContentBarrier can filter common protocols used by online games such as World of Warcraft and Quake. To activate game filtering for the selected user, check the Block connections to game servers box. This setting will only block those games that access a server in a way that ContentBarrier can identify: standalone games and those played within a web page will not be affected. ContentBarrier can filter streaming audio and video, which is audio or video content that is played back live, rather than after downloading. To activate streaming filtering for a selected user, check the Block audio/video box. There are no options for game server or audio/video filtering; they are either active or inactive. ContentBarrier can filter file transfer software, which is often used to share files over the Internet. To activate file transfer filtering for a selected user, check the Block peer-to-peer and/or Block FTP box. There are no options for file transfer filtering; It is either active or inactive. ContentBarrier can filter incoming or outgoing "secure shell", or SSH, which is commonly used for logging into remote computers. To activate SSH filtering for a selected user, check the Block SSH that enables remote access and file transfers to computers across the network box. This setting will block communications that take place using SSH's default port 22. ContentBarrier can stop your users from mounting external hard drives, iPods, USB thumb drives, CDs, DVDs or other volumes, thereby preventing them from introducing new software or content onto the computer via hardware that's directly connected to it. To activate Volume filtering for a selected user, check the Prevent hard disk and other local volumes from mounting on this computer box. ContentBarrier can filter content on your local network that is not accessed via the Internet. To disable filtering of content on the local network, check the Trust content from the local network box. There are no options for Computer Security filtering; it is either active or inactive. If you do not have a monitoring feature turned on, there is no activity to view. So for example, if you do not have the setting for recording screens turned on under the Recording section in Configuration, you will not see any screens when you go to the Recording section in Activity. You selected the user and chose “Enable Protection” in the Configuration section without configuring any other protections. You can make intuitive configuration changes from many of the activity viewing windows. In general, if you hover the mouse over an item shown in the activity view, you will be given prompts that help you change the configuration in a logical way. For instance, while viewing websites that have been blocked or visited for a user that has some form of web content blocking turned on, when you move the mouse over a website, you’ll see a set of options for configuring that site. In this example, when the mouse moves over the row containing the blocked website, prompts appear to trust the site for the current user or all users. This category allows you to view what websites the selected user has visited or attempted to visit. Sites that have been blocked are shown with a red circle next to them. Sites that were allowed are shown with a green circle. If website filtering is turned on for the selected user, when you move the mouse cursor over a row you may toggle the site to be blocked or allowed. This allows you to view chat activity that has occurred for the selected user. The left side of the window shows the other user IDs the selected user has been chatting with. Select a user ID to see chat threads with that user. Chat configuration does require some configuration in the chat program itself. See this article for more detailed information on configuring chat monitoring. If you turn on screen or keystroke recording, you may come here to view content that has been recorded. Change the view using the selection control at the top of the window. The first view (on the left) shows a Time Machine-like view that allows you to very quickly navigate through recorded screenshots. 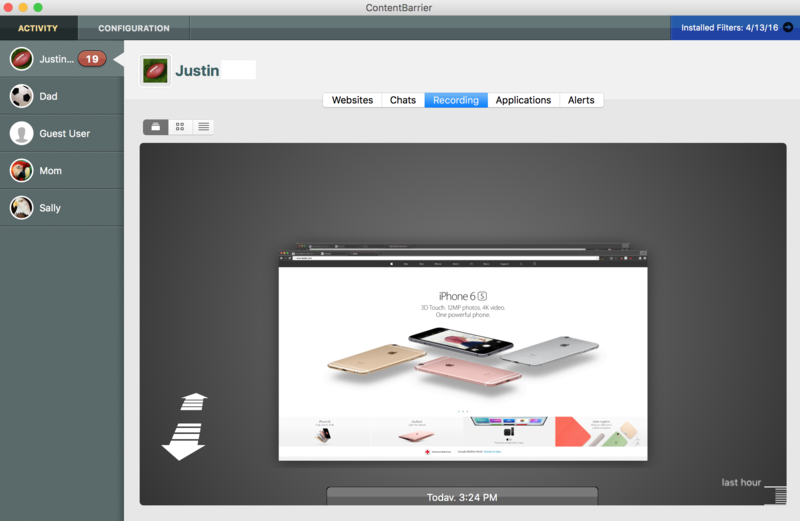 The second view shows an icon-like view of recorded screenshots. Lastly, the view on the right shows recorded keystrokes. If you have configured ContentBarrier to allow only certain applications to use the network, the applications activity view will show you applications that have been blocked. Move the mouse over a row showing a blocked application and you will see prompts that allow you to reconfigure ContentBarrier to allow those applications. This is not really activity in the strict sense of the word; however, it shows general information that you would want to be aware of as a parent. For example, if your child tries to view a blocked site there will be an alert. If he or she tries to access the Internet outside the schedule you have created, there will be an alert. When you first open the Log, it shows a record of all users' Web access attempts for the past week. You can filter log entries by clicking the popup menus in the bar at the top of the window. Display activity for: select the name of a specific user, or leave it on the default setting, All Users. since: choose from Last Week, Last Month, or Forever. Group by: makes ContentBarrier reorganize list entries according to user name or the date of attempted Internet access. Everything or Blocked Items: tells ContentBarrier to show all either all Internet access or only those that ContentBarrier has blocked. You can also search for specific log entries by typing the desired text in the search box at the top of the window; as you type, all entries disappear except for those matching your search. To show all log entries again, click the "X" next to the search string. 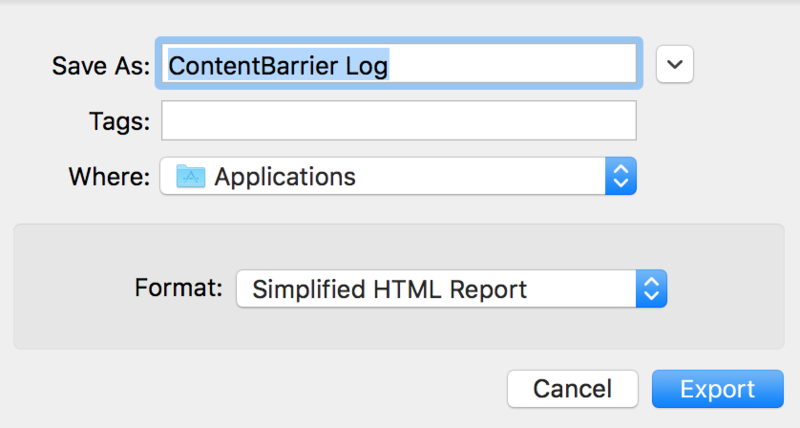 Some of ContentBarrier's logging behavior is determined by settings in its preferences, which you access by choosing ContentBarrier > Preferences…, or by pressing Command-, and then by clicking the Reporting icon. Record visited websites: if this is checked, ContentBarrier keeps a list of all visited websites in its log. Otherwise, ContentBarrier only records those websites that are blocked or filtered. Record sent and received e-mails: records all e-mails sent and received by users. Record chat conversations: records all chats and instant message conversations. Record logs for unprotected users: keeps track of Internet usage by users whose access isn't restricted in any way. By default this is turned off. Delete records older than…: allows you to throw away logs beyond a certain age to preserve hard drive space or improve security. By default, logs are kept for two weeks. E-mail: allows you to specify where you'd like e-mailed reports to be sent. Send AntiPredator notifications immediately: if you check this, ContentBarrier will send you an e-mail whenever it detects "predatory" text strings in chat. Send reports: when checked, you'll receive a report of the type specified periodically, with the frequency you specify, and to what e-mail address the reports are sent. Alerts: these two checkboxes let you determine whether users are alerted of blocked access with a floating alert, a sound, or both. (Users are also alerted to ContentBarrier's activity by being redirected when they attempt to access a forbidden web site. 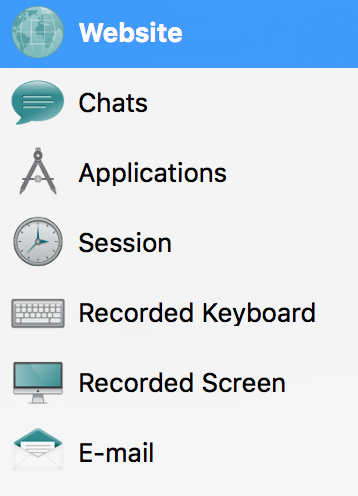 The Log window's left-hand column lists types of log entries: Web, Chats, Applications, Session, Recorded Keyboard, Recorded Screen, and E-mail. Clicking any of these log types displays only those entries. For example, clicking Session tells you of times when your user attempted to use the Internet, while Applications tells you which programs attempted to connect to the Internet. Each line in the Log contains five different pieces of information: a colored icon, a disclosure triangle, the Name of the site attempted, the User who attempted to access that site, the Date of the attempted access, and the Duration of the visit. Icons are either green (showing successful Internet access attempts) or red (showing attempts that were blocked). Red icons do not necessarily indicate that an entire page was blocked; they may display when parts of a page were blocked. User shows who attempted to access the Internet. User names display after you click a disclosure triangle to display the different parts of a web site that were accessed or blocked. Duration shows how long this Internet access attempt lasted. By default, log entries are sorted according to the last attempted access. You can re-sort the log according to any of the five criteria by clicking the appropriate header at the top of the column. Click again, and the column re-sorts in the opposite order. Choose a log entry, then click the Quick Look button at the Log window's bottom right. ContentBarrier will connect to the Internet to show you what the web page looks like. This preview is "live" - that is, you see the page as it exists right now. It is possible, at times, that a web site might not be available; if so, double-clicking will not display the site. Also, some of the elements of a web page are merely parts of a page, and will display as such. You can dismiss this window at any time by either clicking the "X" in its upper-left corner, or by pressing the Escape key. When viewing log entries for websites, you can quickly allow or block websites that are listed in the log by holding down the Control key and clicking a log entry. Select Trust Web Page or Block Web Page from the contextual menu that displays, and ContentBarrier adds that site to the list of allowed or blocked sites. Similarly, you can allow a blocked application to access the Internet by clicking its log entry while pressing the Control key, and then choosing Allow Application. Keyboard and Screen Log entries are grouped according to the application being used so, for example, all text typed into Microsoft Word appears under a "Microsoft Word" listing. Clicking the name of any application shows you all the activity that occurred while that application was being used in the right column. You can hide this column at any time by clicking the bottom-right button. As with other log entries, you can see a visual snapshot of the user's actions by double-clicking an application, or selecting it and then clicking the Quick Look icon in the bottom right corner. A quick look window appears, letting you page through all screen shots or keyboard captures made while that application was being used. You can export ContentBarrier logs as HTML files to view them later in a web browser, or as text files. To do so, select one or several log categories (Web, Chat, Applications, etc. ), then click the Export… button at the bottom left of the Log window. A sheet displays where you choose a name for the log, a location to save the file, and the format. Simplified HTML Report: shows global elements from the selected categories; what you see before clicking a disclosure triangle. For example, for websites, only the name of the site is shown, not the actual URLs of pages visited or blocked. For keystroke recording, only the name of the application is shown, and not the actual text recorded. Complete HTML Report: shows all ContentBarrier activity in detail. All selected categories show all activity. Complete Plain Text Report: shows the same information as the Complete HTML Report, but in a format that's useful for further analysis (in, for example, a spreadsheet or custom-programmed application). Click Save to export the log in the selected format. To erase all information stored in the log for all users, click the Clear… button at the bottom of the Log window.